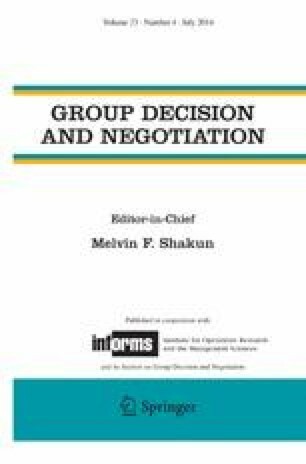 Reasoning on multiple criteria is a key issue in group decision to take into account the multidimensional nature of real-world decision-making problems. In order to reduce the induced information overload, in multicriteria decision analysis, criteria are in general aggregated, in many cases by a simple discriminant function of the form of a weighted sum. It requires to, a priori and completely, elicit preferences of decision makers. That can be quite arbitrary. In everyday life, to reduce information overload people often use a heuristic, called “Take-the-best”: they take criteria in a predefined order, the first criterion which discriminates the alternatives at stake is used to make the decision. Although useful, the heuristic can be biased. This article proposes the Logical Multicriteria Sort process to support multicriteria sorting within islands of agreement. It therefore does not require a complete and consistent a priori set of preferences, but rather supports groups to quickly identify the criteria for which an agreement exists. The process can be seen as a generalization of Take-the-best. It also proposes to consider one criterion at a time but once a criterion has been found discriminating it is recorded, the process is iterated and relevant criteria are logically combined. Hence, the biases of Take-the-best are reduced. The process is supported by a GDSS, based on Logical Information Systems, which gives instantaneous feedbacks of each small decision and keeps tracks of all of the decisions taken so far. The process is incremental, each step involves low information load. It guarantees some fairness because all considered alternatives are systematically analyzed along the selected criteria. A successful case study is reported. The authors thank their colleagues from the Computer Science Department of the INSA of Rennes who attended the committee case study. They thank Sébastien Ferré for designing, implementing and maintaining Camelis, as well as for numerous inspiring discussions. They thank Alice Hermann for her help on the design of the questionnaires. They thank Floyd Lewis and Gwendolyn Kolfschoten for fruitful discussions.